for February 19th are Sorrowful. Talk by Fr. Edward J. Carter, S.J. Applying that to our calling to Shepherds of Christ—there’s more work to this Movement than any of us, individually or all put together can ever attend to properly. What I am getting at, if you really feel you’ve been called to this Movement and especially to the apostle's level, I am suggesting to you very fervently and hopefully, persuasively, the Shepherds of Christ Ministries can use all the spare time, all the ministerial time you have to give to the work of the Kingdom. You don’t have to go around looking for other ministries to contribute your time to. You are free to do that, you are free to leave the Movement at any time. We are not forcing anyone to stay, we hope everybody stays but we have had people leave. So there should always be that, that sense of freedom if you want to lessen off your commitment or hopefully it would never happen, but if you would chose to leave the commitment, Jesus respects your freewill. But looking at it again positively I’m suggesting to you—there is so much work to be done in the Movement. So this first day of February which happened to be the month of the feast of St. Claude de la Columbiere, February the 15th, who has been one of the greatest apostles to the devotion to the Heart of Jesus in the history of the Church, so in a certain sense it’s a type of month of the Sacred Heart because of his feast, so I ask that all of us renew our commitment to the Movement. And again realize the great privilege, that’s one of the first ways to persevere in the Movement and to grow in the Movement, everyday to thank God for the great graces He has given you in the Movement. And I ask you just briefly to look back over your lives, now compared to when you joined the Movement. Has not Our Lord through Our Lady drawn you so, so, so much closer to Them. And He in turn has led you so much closer to the Father and the Spirit. The chairman of our theology department, the first departmental meeting when he took over, he said Xavier has been very good to me, now I feel it’s payback time and I think I should serve the University being chair of the Theology department. Being chair of a department, it’s really a pain of any department. But those words stick in my mind, he says now it is payback time. I should payback Xavier for all the good Xavier has done to me. I suggest we keep that in mind in reference to Jesus in His Movement. It’s always payback time. He does not give us graces and gifts in the Movement just for ourselves. Every gift of Jesus has a social dimension, it’s meant not only for my own spiritual growth, but for growth of the Kingdom. And so if we find ourselves becoming somewhat complacent in our gifts received through the Movement and not properly using them at least to the full extent that we could and helping to spread the Movement, helping to spread the Kingdom, then let us resolve here and now to do better. Perseverance in the Movement—all vocations, all callings need perseverance. I pray for perseverance as a Jesuit every day of my life. I pray for perseverance. I’m suggesting to all of us that we pray for perseverance in the Movement and not just a status quo type of perseverance, but pray for a perseverance which will allow us to dynamically grow and be greater apostles in the Movement. And we have to take the means to persevere. First of all, of course, is Mass and communion, then our visit to the Blessed Sacrament, saying the rosary and listening to at least five minutes a day to a live rosary which Rita receives, praying the hourly prayers without feeling overburdened. If you begin to feel overburdened by the hourly novena just make a 30 second prayer, say Jesus, say the three invocations, “Lord ask and you shall receive, seek and you shall find, knock and it shall be opened to you, through the intercession of Mary, thy most holy mother I knock, I seek, I ask that my prayer be granted” and just say we pray for all needs of the Shepherds of Christ Movement and the other two invocations. You can do that in about 30 seconds. And then at times of course when you have the time and you feel moved bring in the specific intentions. But that hourly prayer has great power to keep our motivation up but it should not on the other hand feel burdensome to you. If it feels burdensome to you for any length of time, just use the short form for quite a while. Reading the Blue Book messages, at least just a few minutes a day, can do wonders to help us persevere in the Movement. Renew your love and commitment to the Movement. Included in that renewed love and commitment I think should be a resolution that we don’t bad mouth the Movement, certainly not to those outside the Movement, certainly not even to those within the Movement. We have problems, we always have had some, we always will, the universal Church has monumental problems. But we have to learn how to handle the problems responsibly. If you have a significant problem please contact John or Rita, talk it over with them, with me if you feel so called. They usually report problems to me. I’m in constant contact with them. Currently I talk to them each day about the Movement, what’s going on, strong points, weak points and so forth. If you have problems with the Movement, don’t spread your problem with the problems to somebody else who starts to think negatively also. I mean go to Jesus, of course, first of all, but then bring your problem to somebody who has the authority in the Movement to handle it. That’s very, very important, 'cause our loyalty and love for the Movement, I think are significantly harmed when we don’t take that approach. Obedience in the Movement is going to become more and more important as the Movement grows. Any organization needs a certain structure, a hierarchy of command, obedience to legitimate authority. When John asks you to do something, please try to answer his request. If you can’t, just tell him I can’t do it now. When he directs you to do something, which is stronger than a request, don’t give him a hard time. Jesus wants obedience in the Movement. No Movement can survive or progress without obedience, without a structure of command. John has a terrifically difficult job. Don’t make it more difficult for him by, as I say, giving him a hard time or by never answering his request for help. I understand that the level of volunteerism here at the center has gradually slackened off over recent months, and it is very difficult to get people together to do our mailings. We can’t keep depending on just a few people all the time. Here again it’s payback time. I mean everyday is payback time. You can never fully repay Jesus for what He has done for us or what He continues to do for us. Now we have to use Christian prudence in all this, we’ve got family duties; we’ve got other duties that’s God’s will for us. We have to take care of those. But granting all those other calls on our time and our energy, if Jesus has called you to this Movement, He’s called each and every one of you, then He expects you to live up to your commitment. And if it’s always looked upon, if you feel it’s always more of a burden than a privilege, then I think a person has to consider, 'Shall I stay in the Movement?' Jesus loves a cheerful giver. Suffering is involved, is it not? Any following of Christ involves suffering. Any non following of Christ brings suffering, and a greater suffering—those who don’t believe, who don’t have any religious faith or conviction. They end up suffering much more than we who suffer in the following of Christ. FATHER CARTER'S VOICE WAS VERY SAD and VERY LOVING. To follow Jesus entails a willingness to suffer for Him and His cause. The furthering of any worthwhile cause demands a spirit of sacrifice, a willingness to endure a variety of hardships and difficulties. We cannot expect it to be otherwise regarding the cause of Christ. To help further the process of ongoing redemption demands a price. There is an almost endless variety of pains, sufferings, and difficulties which can arise in following Jesus and promoting His cause. At times seeing few, if any, visible results of our labors, feeling unappreciated, experiencing opposition, sometimes comprehending that we are being hated precisely by some of those whom we are striving to help, at times being laughed at and ridiculed—these are some of the ways we experience the sufferings of an apostle. The suffering involved in contributing to the process of ongoing redemption is not, however, the complete picture. The happiness resulting from commitment to Christ and His mission far outweighs the hardships. To be aware that one is so intimately loved by Jesus, to experience the satisfaction that one is contributing to a cause that cannot fail, to play a role in helping to bring to others the love and peace of Jesus—all of this makes for a life that has no equal. The committed follower of Christ, experiencing what it means to be closely associated with Jesus, realizes why St. Peter said, Lord,…it is wonderful for us to be here. (Mt. 17:4). But we hold this treasure in pots of earthenware, so that the immensity of the power is God’s and not our own. We are subjected to every kind of hardship, but never distressed; we see no way out but we never despair; we are pursued but never cut off; knocked down, but still have some life in us; always we carry with us in our body the death of Jesus so that the life of Jesus, too, may be visible in our body. Indeed, while we are still alive, we are continually being handed over to death, for the sake of Jesus, so that the life of Jesus, too, may be visible in our mortal flesh. Now I will give the blessing. May the blessing of Almighty God, Father, Son and Holy Spirit descend upon you and remain forever. Amen. from it and live as a wounded healer. I am Yours to possess. I am Yours to use. I want to be selfless and only exist in You. Help me to spoon out all that is me and be an empty vessel ready to be filled by You. Help me to die to myself and live only for You. Use me as You will. Let me never draw my attention back to myself. I only want to operate as You do, dwelling in me. Love does not run out. R. Dear Jesus, Give me Your hand to write this book for you. I am your servant. I want to be Your hand to this world. If you, Lord Jesus, would write a book, what would you say? Today I come to deliver a message to each of you. I want to tell you of each person's dignity, of their beauty and their self-worth. Each child is, oh, so uniquely precious to My Most Sacred Heart. Each child is full of the talents I have given to them. Each person is divinely created by God and given all these gifts to be happy and love one another. The problem comes when you feel you will be left out. That you will be left by another who has trodden on you and will do it again. I see you all as My most precious children. I watch your every move and know all pain and anguish in your heart. My Heart aches, you have insecure feelings about yourself. I came to this earth I died for you. I felt cold, hungry, lonely on this earth. You need not worry that no one knows the pain and anguish in your heart. God created you with such special gifts and talents. It is important for you to raise above your wound and forgive those who hurt you. You need only turn your will and your life over to Me and I will guide you in all your ways. I have all the Power. Many are not of My ways. The key to life is to recognize your faults, but still know you are this precious gift of My Father a gift to this world. This world is in need of your strength. Running yourself down, blaming others hurting them can cause you misery and pain. At this very moment, you are the precious creation of God!! You must operate with Me in your heart. You need not run yourself down. I am with you every day guiding your ways, lest your foot stumble and you lose your way. You will not wander far from your path if every day you keep bringing your focus back to Me. If you dare let Me be at the helm, if you dare to really let Me run your life, I will do with you such wonders that you yourself would be amazed. But you will know with such ease when you did these things that you did not do them alone. You will know My power, moving the mountain, My power chipping at the stone, My power working on your hardest problem and you will be set free. Oh yes, you will be set free and know a serenity that only comes from letting go and letting Me run your life. To you, My child, I have given all that is good. I made you My holy soldier, My warrior in a world of pain and hatred. You are the light that shines in the darkness, you are the coat to a cold child, you are the smile that warms a troubled and lonely heart. You are the comfort for everyone you meet, because My most precious Heart powers you, smiles through you, understands and loves through you. Love your fellows for Me. There are so many troubled hearts that need to know My love. I can love through you if you let Me, I can be their friend through you if you let Me. I am He who comforts you and you are he who comforts them. My power is endless, it never runs out, there is not a power failure EVER. In your darkest hour, My light shines in the darkness and I say to you, "Oh blessed of My Father, look at yourself with awe, you are My creation, you are indeed so precious to Me, you are My light to this world, you are My hands and My feet and most of all My Heart." Oh, you are My loving Heart, to those who are bowed down, to those who are lost in the darkness, you carry My smile and wear My armor in a world that is trying to tear one another down with hate and ugliness. There is gentleness, there is love, there is hope in you, if you open yourself up to Me. Be My knight to the world, wear My armor. I am your God and I will protect you from the darkness. Plug into My power, be not afraid, I go before you always and you can rest in My arms when you feel weary. You can put your head in My lap and weep, you will know, I am truly with you and you are My light to this world. I created you so special - to cast out fear in the darkness, to clothe the naked, to give hope to the oppressed, to be as I live in you and love through you and you are My smile and I touch My hurting ones through your love. You are he who loves this world. You must stay plugged into My power-source. This world is hungry for My love. It needs My love, I give to them through you. I am your God and I made you as a gift to the world. You are filled. were wrong promptly admitted it. 1. A message from Florida, a message from Jesus, April the 1st of 1997. Jesus: You are the leader. There will be no one in line behind you. You may be on the hill and look around and no one will appear to be near, but I am there in the silence of that moment. Know I am with you. The Father and the Holy Spirit are with you. You are one with My Mother and are surrounded by angels and saints. The world is blind and they do not see. You must see with spiritual vision. See the world beyond. It is real. You are not alone. I am with you at every second, watching you and controlling your breath. R. This is from the Apostles’ Manual. one may appear to be near, no one is in line behind you. You must be constantly motivated by faith. It comes down to this – it is your belief. For, if I call you and you do not hear Me, then My work will not get done. For I am calling you and you can plug up your ears, but souls are being lost at this very moment that you can be helping through your faith. You must have fervor in your prayers. Satan attacks you all day, in prayer and in work. Will you listen to him or to Me? I am begging you to see Me alive before you as I came forth from the tomb, glistening and all white. I am here. I have called you by name. You are the apostles I am calling. If you say ‘no’ the work will not get done. Read this letter over and over and when you are alone and feel as if you are standing on the hill by yourself see the heavens open up. See Me in celestial light as you saw Me transfigured on the altar. See the great vision of March 26, 1996. Read that message. See Me almost dead on the cross as I was on December 5, 1996 at Immaculata. See My lips move and hear Me speak. No one is listening. They will hear you speak. They will respond to you. Jesus: If you give into satan, they will not hear and they will not know for his whole attempt is to silence you.So you go to the hilltop. You are close to Me. You look around and you see no one. Below the hill is a throng of people. They have forgotten I exist. The heavens open and I appear and the sky is filled with saints and angels. They continue talking and laughing at the bottom of the hill. The celestial light falls upon them and they continue as in a fog and as blind men to focus on the rocks and the things of this earth. And you speak. R. The voice of the Good Shepherd. Jesus: He calls you from the mountain and you say nay for your foolish whims. Come to the mountain top with Me and you will taste of milk sweeter than honey. You will run and not get weary, you will be His faithful witnesses. You will be the children of light shining from the mountain top on the dark world below. Oh, do not say no, My chosen ones, you are My children of light. I have called and you have responded. Do not be discouraged, but encouraged for (she) appears, the Lady of Light, the Lady of Fatima, the Lady of the Holy Rosary. She appears Our Lady in Clearwater to bring about the completion of the Fatima message there. If you do not believe, who will I send to do the work for I have chosen you! The Fatima mission will greatly unfold there through the Shepherds of Christ Movement. She appears Our Lady of Light in all the splendor to call her children to her Son, Jesus. She appears as Our Lady of Fatima, 80 years later, to call to the world, to deliver the same message she delivered then. Come to the water and drink and you will not be thirsty for God has visited His people. He has risen. He sends great gifts in the woman clothed as the sun on your building. Some look and they do not see. Some are touched for their hearts are open to the graces that are pouring out there. 4. R. And Mary speaks on that day, April the 1st. Mary: I appear to you, the woman clothed as the sun, Our Lady of Fatima, in splendor and glory to lead a sick race to holiness, to lead them to healing in the Heart of my Son. For His Heart will reign despite all the actions of men. I appear Our Lady of Fatima on the (former) bank in Florida to you this day. This is my message. This is my little Fatima in the Americas. A permanent sign I give to you this day on the building, a sign for the world and for you. And you, my chosen one, have faith for it is faith that will save you. The devil wants you stopped. If you listen to him, who will lead the people to my Son? You have been called and chosen by me, Our Lady of Fatima, the woman clothed as the sun and there will be the weeping and gnashing of teeth for many will be lost forever. I send you in the darkness as a beacon light to the world. I love you. I am your Mother Mary. 5. Messages from Fr. Edward Carter, S.J. My beloved priest-companion, I am requesting that a new prayer movement be started under the direction of Shepherds of Christ Ministries. I am asking for volunteers who are willing to pray before the Blessed Sacrament for one hour, twice weekly. Members of the Shepherds of Christ prayer chapters, as well as others, are to be invited to join this movement. These apostles are to pray for the intentions I am giving you. For part of the hour they are to use the prayers of the Shepherds of Christ Associates Handbook. They may spend the rest of the hour as they so choose. 6. For all members of the Shepherds of Christ Movement. and for the spread of this movement to the world. ‘I am giving you this message on this day, the 77th Anniversary of the Great Apparition at Fatima, because of the close connection between the Shepherds of Christ movement and the Fatima message. The Fatima message is centered in devotion to My Heart and My Mother's Heart, especially in consecration to Our Hearts. Shepherds of Christ Ministries is also centered in devotion to Our Hearts. I will use Shepherds of Christ Ministries as a great instrument in helping to bring about the triumph of the Immaculate Heart and the reign of My Sacred Heart. When this occurs, My Church and the world will be experiencing the great era of peace promised by My Mother at Fatima. “Jesus has told us that Shepherds of Christ Ministries includes: the priestly newsletter, Shepherds of Christ, Shepherds of Christ Associates prayer chapters, various ations, including books, whatever else Our Lord directs us to undertake. - From In the Hearts of Jesus and Mary, Newsletter of Shepherds of Christ Associates by Fr. Edward J. Carter S.J., Volume 1, No. 1, 1995. p. 2. 9. From Tell My People by Fr. Edward J. Carter, S.J. Jesus: “My beloved priest-companion, I have allowed you to experience in extraordinary fashion the riches contained in My Heart and My Mother's Heart. I desire that you tell all My people about these riches. I desire that My people consecrate themselves to My Sacred Heart and to Mary's Immaculate Heart. My people are living in the beginnings of the age of the Two Hearts. 10. R. This is from February the 23rd, 1997 of last year in the Apostles’ Manual on pages 250 - 251. It happened some time later that God put Abraham to the test. “Abraham, Abraham!” he called. “Here I am,” he replied. God said, “Take your son, your only son, your beloved Isaac, and go to the land of Moriah, where you are to offer him as a burnt offering on one of the mountains which I shall point out to you. Then taking him outside, he said, “Look up at the sky and count the stars if you can. Just so will your descendants be,” he told him. Abram put his faith in Yahweh and this was reckoned to him as uprightness. R. This is how it is and then we look into the Apostles’ Manual and we see the stars on the Christmas tree. For that is what He told me to do in the Apostles’ Manual on page 184 and 185. He said, “As the Shepherds of Christ Movement spreads (as well as other movements focused on spreading consecration to Their Hearts) the tree is covered with more hearts and the earth becomes more lighted.” And He told me to put stars all over the tree. This is how it is. For what we do here is making the sky as numerous with stars all over the earth as we spread the consecration. And so Abram did not understand how this would come about. And we do not understand how this will come about for the earth is majorly barren and is not bearing fruit as Jesus wishes it to. And what will end up happening as we spread the consecration, the earth is being filled with children for the Kingdom of heaven. And the stars will be as numerous as the stars in the sky. Jesus: I am the Good Shepherd, these are My prayers, the prayers I give to help renew the Church and the world, all prayer chapters are asked to include these prayers (found in the Shepherds of Christ Prayer Manual). As My Apostles and Shepherds I ask you to encourage all existing Chapters to try to encourage all existing prayer groups to pray the Shepherds of Christ prayers. Encourage all Churches to pray these prayers. It is most urgent that the people of this earth concur with the Father's wishes to begin Prayer Chapters. This is an urgent request from the Good Shepherd. The flock will become one when they have given their hearts to Jesus and Mary. Encourage all priests to pray the Shepherds of Christ prayers. Your world will be lighted with great light as the people of this earth pray these prayers. 3. R. On December the 5th, Jesus appeared at the point of death and His mouth was moving because no one was listening. Around December the 17th, the woman noticed Mary appearing on the building, Our Lady clothed as the sun to lead the children into the light. On the back of the Mary Message card that we circulate in Florida, it says, Mary says that this is my Son, He is the Light of the world. On August the 20th, after Fr. Carter was reinstated, Jesus appeared on the cross and He was transfigured with the greatest light and I heard the voice of the Father speak and He said, “This is My beloved Son in whom I am well pleased. Listen to Him.” You are the voice of the Living God. You are the voice of the Good Shepherd speaking in this world this day to unveil the Scriptures and to lead the children to the light. He speaks in these messages. He is not giving messages like this to other visionaries. He is not speaking in our heads. He is speaking in the messages. We must take the messages to our heart and study them before the Eucharist. Study them so that we will know what this mission is that He is calling us to. It is important to the salvation of the world, to the state of the world. For if we do not do what He is calling us to do, this world could go into a war. 4. R. There is not time to tarry. This is the book He is asking you as apostles to study, the Apostles’ Manual. Have you studied this? This is the voice of the Good Shepherd. For us to be His apostles, we must study and study it. He wanted this message in there. It was towards the end where He says, on Ascension Thursday, He gave this message, May the 25th, 1995, and He called out and He says, “I am alive. I am alive. I am alive.” This is how it will be as the word is brought forth in their hearts. He will be alive in their hearts and the world will hear that God, the voice of the Good Shepherd, speaks and lives in the hearts of men. R. I cried so hard, I have never been so immersed in heartache. I heard Him shout, “I Am Alive, I Am Alive.” I cried so hard, I could hardly write. Jesus: The earth shakes and the Son of Man appears. He lives in the hearts of all. I want hearts on FIRE for love of Me. I want vibrancy and love from My beloved ones. Hold not back My love from this world. 8. R. In the reading from today, a reading according to Mark, we live these readings. R. This is really from last year. But it’s in the Apostles’ Manual because He told me to put it in there. through His Son Jesus, God-made-Man. Luke 9: 32 but they woke up and saw his glory and the two men standing with him. R. Peter got another idea. Luke 9: 33 ...so let us make three shelters, one for you, one for Moses and one for Elijah.’ He did not know what he was saying. The Father speaks when Jesus is hanging on the cross in a transfigured state and He says to me, “This is My beloved Son in whom I am well pleased. Listen to Him.” He appeared on the cross on December 5th and His mouth is moving because people do not hear what They’re saying. But He has given us this mission. And how many of us have another idea? Do we want to be shepherds? Then we will listen to the words that the Good Shepherd is speaking to us and realize the great gift that He has given to us in this mission! And I beg of you, other ministries are for others! This is a gift! If you want to be an apostle in the Shepherds of Christ Movement, you will read and study the messages in the rosaries given. Are you a shepherd? Or do you want to be something else? And if this is your mission, then you must follow the directions that Jesus is giving to us this day. He speaks to us, the voice of the Good Shepherd. He did not tell us to build tents; He told us to build a chapel. He tells us to circulate this material. He tells us to study and read the Apostles’ Manual. For years to come, men will study these writings. What you do today will make the difference to the condition of the world. “Are you a shepherd?” He says. I think it was around January 25th. “Are you a shepherd?” He keeps saying what He wants but we don’t hear what He wants. He wants you to be a shepherd. If you only want to be an associate, that is quite alright. But we are spread thin and He has called you to this mission. Will you commit as a lay apostle to the Shepherds of Christ Ministries? We go home, but we live this life. It’s like that tree in the Apostles’ Manual with three or four stars on it. And in order to get the one on the other side, you have to be the voice of the Good Shepherd delivering these messages. He has given us the direction. 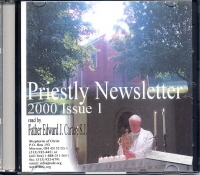 We need to spread the Priestly Newsletter. We need to spread the Prayer Chapters. We need to get the rosary and the consecrations in the school. Our function is the completion of the Fatima mission. 3. R. On March the 26th, 1996, a message for Fr. Carter from Jesus. Jesus: To him who has eyes to see, they will see - not with earthly vision, but with the eyes of faith, and to him who has ears to hear, he will hear with the fluttering of the Spirit moving within him. There will be one flock and one Shepherd and My staff will rule over all. Hearts consecrated to Our Hearts will lead the light across the earth. This light will be a light of intense brightness, brighter and hotter than any light from a flame. It will be the fire of God’s love. The Spirit will move in the hearts of all consecrated to My Heart, and you will know how fire truly spreads, for the love of God is a fire. It is vibrant. It is encompassing. It is smoldering, burning deep within and speedily spreading on the outside. No fire on this earth can ever describe the burning embers that burn from the Sacred Heart of Jesus. No fire burns like the fires coming from My Heart and hearts filled with the love from the Sacred Heart of Jesus. I have written your name, Fr. Carter, in My Heart, never ever to be blotted out and this earth will be renewed with the fire of God’s love through you. You are My beloved priest-son, forever, according to the order of Melchizedek. Most holy and most sacred are your hands that consecrate the Host and write My precious newsletter for My beloved priest-sons. You are never unguarded. You are held within the deepest chamber of My Heart, and you will spread My love to the priest-sons of this earth. 4. 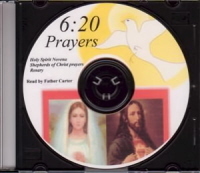 R. Jesus gave us a message on November 3rd telling us we must pray to the Holy Spirit. When I failed to obey the message, I suffered intently for three days. He woke me on November the 8th telling me we must, must all pray the novena daily. We must pray the rosary, for the Holy Spirit works in the rosary giving us great lights, revealing insights into the mysteries when we consecrate our hearts to Mary. 6. R. This is from Revelation. R. And then after the flood, listen to this. Then the dragon was enraged with the woman and went away to make war on the rest of her children, who obey God’s commandments and have in themselves the witness of Jesus. Mary: I appear on the building to draw men to the messages given in God’s Blue Book, Rosaries From the Hearts of Jesus and Mary and Tell My People. These books are the messages we give from our Hearts to draw men to our Hearts. They are the messages my Son gives to bring about the reign of His most Sacred Heart. I ask you to circulate Mary’s Message in Florida and the rosaries (special Marian meditations and messages) of December 13, 1996, and January 13, 1997. These messages were given to reveal insights into Jesus’ most intimate love. My appearance in Florida and the Shepherds of Christ Movement must be connected. Please work with great fervor to spread my messages and the message of my Son from this location. Do not be afraid. You will make great advances in helping with the completion of the Fatima Message there. Jesus: ....I did not put you on the earth and then leave you to yourselves. I dwelt amongst you to guide you in all your ways and the people today spit on Me as they did 2,000 years before. For all these years I waited for the likes of you, My people, and why should you have more time for false joy? Joy is not in the molten calf. It is in the words of the Savior. I give you sunshine and rain and you want flowers and glory. The glory is Mine or I will have to continue to listen to the wailing widow, a barren branch, a company of stiffs. Ignore Me no longer senseless ones. My hand is upon you. It will come down and wipe out the senseless virgins, the ones singing to the molten calf. R. On November the 8th, 1997, I was waken at 3AM after suffering so badly the day before, first Friday. I had run from the center the night before crying because of the urgency of the messages and the suffering. I feared He would do something to the world, maybe a war, because the problems at the Florida site and the Mary Message of November the 5th, 1997 in the rosary. I suffered and cried in great pain, not to be heard because I feared His wrath. R. And He speaks in these messages. R. So, He gives to us the scriptures and He is unveiling the scriptures in all of the writings, and when They speak through the rosary is majorly coming, the “R’s” in the book, are coming from the Holy Spirit. 3. R. This is a message from Mary and it’s not the first, because there was another one in the rosary on the 5th. Jesus: My dear Florida apostles, you must bind together in one mind and one heart. I am asking . . . to write up the rosary of March the 5th, 1998, to give a copy to . . . All are to pull together to secure the building of Eucharistic adoration. The messages given are the plans of the Father, and the request of Mary are to be given to the owner of the building. I am requesting the Shepherds of Christ Movement to receive ownership of the building as a center of Eucharistic adoration. The Eucharist is to be exposed behind the Lady clothed as the sun. The Blue Book messages are to be circulated from this center and in the chapel. I request the building be converted into a mammoth chapel of Eucharistic adoration and the Shepherds of Christ materials be circulated from this site. Mary appears the woman clothed as the sun to lead men to the Eucharist and to the messages I give in Rosaries from the Hearts of Jesus and Mary to unveil the scriptures and bring about the Reign of My most Sacred Heart and the triumph of Mary’s Immaculate Heart. Give this message to certain people, . . . Sr. Elizabeth and her superiors. I request this message and the message of Mary, March the 5th, 1998, be given to the owner, Mike, and that he be given the messages concerning the Father’s plan for the building. I request this message be sent to . . . and all that I will reveal to you in the future. I beg you to listen to Me. This is a major part of the mission begun at Fatima. Mary appears, the Lady clothed as the sun to lead man to the Light. I am Jesus, the Light of the world. I will Reign, the Lord of Hosts, on My throne. You must spread the consecration to the churches, school, and family. I give you My message of January the 22nd, 1998 for the world. Circulate this message from Florida. Give it to all listed. Prayers must be said for the renewal of the Church and the world. I give the prayers of the Good Shepherd in the Prayer Manual to bring about the Reign of My Heart, the Reign of My Eucharistic Heart. I love you. I am Jesus, Savior of the world. Harken to My voice. 4. R. This is a message I got yesterday which was the anniversary of that Big Boom message in the second Blue Book, and it says. Jesus told me to write this book. It’s called The Spouse of the Lamb which is messages or really writings that I write after the Eucharist, concentrating all the time on the fact that He is the Bridegroom of our soul and intently giving Himself to us. We hear the voice of the Father speak, “This is My beloved Son in Whom I am well pleased.” and we hear the voice of the Good Shepherd speak as He reveals His Father to us and His plan for the salvation of all men living according to His will. I am the Father. My plan is unfolding through you, My beloved priest, Fr. Carter, and Rita and the core group in the Shepherds of Christ Movement. R. And it’s through the writings and messages of Fr. Carter and Rita that many will be touched. God the Father: My Son has revealed Himself as never beforein history into His tremendous love for men and you treat Our gift with such indifference. R. This is from January the 18th from the Father of 1997. God the Father: I am talking through these messages given by My Son and Mary to tell you how to accomplish this task of carrying out My plan. R. He speaks through Jesus, His Son, the Son of God, God-made-Man. He further states this in this message. I haven’t received a long message from the Father in long time and then the Father spoke really since that, well, I got one on February the 10th, I know. So I can’t say I haven’t received, they were mostly in 1997. So the other day, I got this message, March the 7th from the Father. “Oh ye of little faith,” That is the word. It’s faith. 7. R. And there’s something in this January 18th message. This is where I really saw that Jesus was revealing the Father’s plan in the big, old Apostles’ Manual. It was at the bottom of the page and the Father said that He was revealing His plan through Jesus, His Son, in these messages and He said the Son of God and then He said the Son of Man. R. We have to be born, brought forth in the spiritual womb of Our Lady, her Immaculate Heart, in the Holy Spirit, especially in order to see the light. 10. R. And this is the reading today. This is like Jesus speaking to us from Philippians. Brothers, be united in imitating me. Keep your eyes fixed on those who act according to the example you have from me. R. This is like us saying this. We got to follow these messages. or there are so many people of whom I have often warned you, and now I warn you again with tears in my eyes, who behave like the enemies of Christ’s cross. R. This is the word of the Lord. 2. R. This is at the end on Chapter 11 in Revelation. Then the sanctuary of God in heaven opened, and the ark of the covenant could be seen inside it. Then came flashes of lightning, peals of thunder and an earthquake and violent hail. Now a great sign appeared in heaven: a woman, robed with the sun, standing on the moon, and on her head a crown of twelve stars. She was pregnant, and in labour, crying aloud in the pangs of childbirth. 5. R. And how does the Lady look at night? For she is dark and smoky looking in the window in Clearwater. But the sun comes up and slowly it steals across the beautiful sky there. And the sky is heightened with this tint of beautiful pink. And very lightly it comes across a darkened sky and it is very mystical looking as we look at the sky. Kind of like the mystery of God, it is revealed to us a little at a time. And then, the bright light of the noon day shines on the woman on the building, Our Lady clothed with the sun, and she shines in such brilliance. But she shines ever more brightly when the people are there and they are receiving the materials that will lead them into the Heart of her Son through consecration. This is her intention that the children of light lead the rest of the world into the light through these messages, for it is the voice of the Good Shepherd to help bring about the Reign of His Heart. 6. R. Is it not that the Lady clothed as the sun comes to lead the world to the Light of the world, her beloved Son? Is it not that He is the all-powerful, that the Lord of Hosts will Reign, that He should be exposed behind this image of Our Lady clothed as the sun appearing to take the children to the Heart of her beloved Son? He is alive. He is alive. He is alive. He is truly present and with us in the Holy Eucharist. He is ignored and forgotten. And the angel at Fatima talked about the indifference and what was going on in the world with the Eucharist. Would it not be complete that the Lord of Hosts would be exposed behind the image of the woman, the Lady clothed as the sun on the building in Florida? Now a great sign appeared in heaven: a woman, robed with the sun, standing on the moon, and on her head a crown of twelve stars. I pray not only for these but also for those who through their teaching will come to believe in me. May they all be one, just as, Father, you are in me and I am in you, so that they also may be in us, so that the world may believe it was you who sent me. 10. R. And we hear it over and over in the scriptures how the Son was sent by the Father to the world, that He is the Word, that He reveals to us the Father in the Holy Spirit. R. The Word reveals to us the Father. R. I lost my voice all that time and Zechariah lost his voice before John was born. And then when I went to Conyers, it was around April the 14th of 1993, I saw this slight man with a burlap sack which I believe to be John the Baptist in the house in Conyers. And then on May the 13th of 1993 I received the first Blue Book message. So from that loss of voice, He silenced the voice of the teacher and He brought forth the voice in these writings that He wanted to be heard. We are that voice. We are the voice of one crying forth in the desert to make ready the way of the Lord. For the Lord of Hosts will Reign on His throne. It is immensely through Eucharistic adoration in our chapters, in our chapels, and in our centers, that we will help to bring the Reign of the Lord of Hosts on this earth. It begins with the Blue Book messages, for the Blue Book messages are centered in the Eucharist and bringing the souls to the Eucharistic Heart of Jesus. 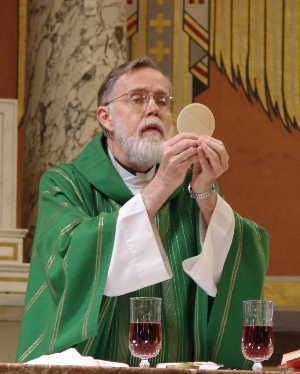 “He was in the world.” That’s the way He feeds us through His Word and through the Eucharist and that’s what He said for those 6 or 7 weeks, “Feed the hungry.” Then He started with all this Eucharist and then all the word stuff. R. And He gives to us His Body and His Blood, His Flesh in the Holy Eucharist. ...and we saw his glory, the glory that he has from the Father as only Son of the Father, full of grace and truth. Jesus: I give to you My Body and My Blood in the Holy Eucharist. Come to Me, My beloved spouse. I am Jesus Christ, the Bridegroom of your soul. I wait for you. I love you. I long for you. Come to Me. I am giving to you the greatest grace this day. My hand is raised, but My hand is held back through the prayers that you are giving to Me in these meetings. I appreciate all the love from your hearts that you give. You must all operate in your hearts. Anyone that you deal with, you should operate in your heart. Mary: The rosaries being recited as candle rosaries and live rosaries on Tuesdays and Sundays are holding back the hand of my Son from this world. R. Mary speaks, that’s what she said February the 5th, 1998. Jesus: I write to you, My shepherds, on January 26th, 1998 about the importance of the rosaries and the hours of the Shepherds of Christ Rosaries from the Hearts of Jesus and Mary. I am giving the greatest graces in these rosaries. The more these rosaries are held back from the world, the more your world will suffer. Mary said that in the end, these rosaries would make the difference to help souls. Your world is on a fine line. The souls are scattered - some for God, many more headed to destruction. The prayers you pray for hours as shepherds in the Heart of Jesus make great reparation to God and to the Immaculate Heart of the Virgin Mary. God will strike the earth with power and the sickle will scatter the souls - some will be lost, some will be saved. The Shepherds of Christ are majorly praying for the salvation of souls in these Rosaries from the Hearts of Jesus and Mary.